We are nearly twelve years old! Founded in January 2007, Shamrock Haiku Journal has since been published regularly. 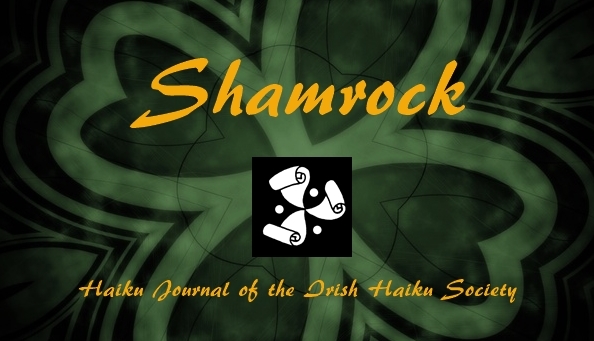 In early 2012 and at the end of 2018, we have prepared two print editions of the forty issues of Shamrock, the Journal of the Irish Haiku Society, as they appeared on the Shamrock website: SHAMROCK HAIKU JOURNAL: 2007–2011 and SHAMROCK HAIKU JOURNAL: 2012–2018. This paper-based collections cover the full range of English-language haiku, from classic to experimental, as well as haibun and selected essays on haiku. "...excellent co-operation between Croatian and Irish haiku poets"
Copyright © 2007–2011 by Shamrock Haiku Journal. Copyright © 2012–2018 by Shamrock Haiku Journal. Copyright © 2007 - 2018 by Shamrock Haiku Journal. All rights reserved. All the Shamrock Haiku Journal contents are copyright by the indicated poets/artists. All the rights revert to the authors and artists upon publication in Shamrock. Any unauthorised copying of the contents of Shamrock Haiku Journal is strictly forbidden. The Shamrock logo image is copyright © by Christine Zeytounian-Belous (Paris, France).